Now the Hezbollah deal has been consummated and Israel has received the bodies of its soldiers. 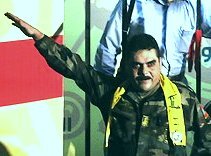 Child-murderer Samir Kuntar is free, enjoying a hero’s welcome in Lebanon, feted not only by Hezbollah’s Nasrallah but also by the President and Prime Minister of Lebanon, and the President of the Palestinian Authority (PA). I was strongly opposed to the deal because of its sheer irrationality. Didn’t it invite more kidnappings? Didn’t it ensure that the price that will be paid for Gilad Schalit will be even more outrageous? Didn’t it legitimize the terrorist Hezbollah even further? But maybe it presents an opportunity to break through the fog of lies created by our enemies — lies about their own goals and motivations and about the nature of Israel, Israelis and Jews. To everyone who thinks that terrorism against Israel is the product of ‘extremists’ and that Israel needs to make peace with ‘moderates’ like PA President Mahmoud Abbas, Lebanese PM Fuad Saniora, etc. : How moderate can they be when they applaud terrorist murderers Samir Kuntar and Dalal Mughrabi, hold them up as heroes and examples? To everyone who’s said that the conflict is primarily about human rights: Do you still believe this? Ghassan bin Jiddo: Twelve men, led by a woman called Dalal Al-Maghrabi, managed to establish the State of Palestine, after the whole world had denied them their right to do so. They turned a bus, going from Haifa to Tel Aviv, into a temporary capital of the State of Palestine. They raised the white, red, and black flag at the front of the bus, singing, shouting, and dancing like children on a school trip. There were real children on a trip on that bus, and 13 of them died in the temporary capital of Palestine, shot or burned to death by Mughrabi and her men. This is the peaceful Palestinian state that Arab societies yearn for. And this is the kind of declaration of statehood they cheer about. Hezbollah, Fatah, Hamas, et al. have all said that the deal is a great victory for the ‘resistance’, showing how much stronger and more resolute they are than the Israelis, who stupidly care enough about the bodies of soldiers that they would suffer enormous humiliation and strategic damage to get them back. It illustrates the difference between civilized people and…something else. There will be another confrontation between Isarel and Hezbollah, and soon enough with Hamas as well. Israeli soldiers will go into battle knowing the nature of the nation standing behind them as well as the nature of the enemy. The results will speak for themselves. This entry was posted on Friday, July 18th, 2008 at 10:51 am and is filed under General. You can follow any responses to this entry through the RSS 2.0 feed. Both comments and pings are currently closed.